When travelling with a pet it is important to know they re safe and secure at all times. Apart from cages and crates for transportation lead and harnesses will also prove invaluable. Just as humans can be injured if they are not secured by a seat belt, our pets too can be injured or killed if your car is involved in an accident. If you have to brake suddenly or are hit with force your pet will become a missile and the force of his body could seriously maim, perhaps even kill another passenger. It is now possible to purchase a harness that will fit a dog securely. These are available in many sizes and have padded straps for comfort. The added bonus of a harness is that it can be attached to a car’s seat belt fixture and the dog is able to travel with the family on the back seat of the car. These are available from car accessory shops, pet stores and also online.Most harnesses have a lead attachment so that the dog’s normal lead can be attached as he leaves the car and there is no need for the purchase of extra attachments.Smaller harnesses for cats, rabbits, ferrets and other small pets can also be purchased for exercise purchase although they cannot be attached to a car’s seat belt. Pets should wear a collar at all time. It is now illegal for a dog to be out in public without a collar with a tag attached. A name tag should show the home contact details of the owner. Beware giving too much information away as anyone petting your animal will be able to read the tag and then knows that you are not home and your property is vulnerable to burglars. If you are staying in one place for several weeks attach a tag with contact details during your stay. If in the unfortunate situation that your pet is lost this well speed up a reunion. Choke chains should not be used instead of a collar when travelling. They are not secure and if used in the wrong hands could choke the pet rather than control him. Always carry an extra lead in the glove compartment of your car. These are invaluable if you come across a stray animal or if the one attached to your family pet is damaged. The lead, whether it is attached to a collar or harness should not be left on the animal during the car journey. Your pet could become entangled in it and choke. He could also chew the lead and if you do not have another one it would be hard to control him when outside the vehicle. You can purchase a type of harness that is attached to a dog’s head and is supposed to help control him if he is not very good when out walking. Do not rely on these leads alone as a lively dog can wriggle free of them and run away. Use a separate collar and lead in conjunction with the head harness. 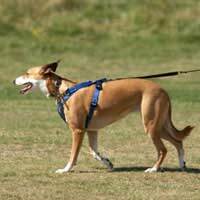 It is possible to purchased extendable leads that allowed a dog or other pet to be ten or twenty feet away from you when out walking. Unless your pet’s under control at all times these items can be dangerous. When street walking a pet could be under the wheels of a vehicle before you are able to pull in the lead to a controllable length. These leads have also been known to break under stress and you then have a pet at the end of a long length of lead that is not properly under control, he could cause damage or ultimately injure himself.